Taylor Lundrigan is this year’s recipient of Softball Canada's Claude Deschamps Memorial Award. Nov. 10, 2016 12:00 p.m.
A former Delta Heat softball player is to receive an award from Softball Canada this weekend. Taylor Lundrigan is this year’s recipient of the Claude Deschamps Memorial Award and will be presented with the award at the Softball Canada Hall of Fame and Awards Banquet in Whitehorse, Yukon on Nov. 12. This nationally administered bursary was established in 1984 in honour of former executive director of Softball Canada Claude Deschamps and is awarded annually to both a female and a male player to put towards their education. Lundrigan, from Abbotsford, is a third-year Bachelor of Arts student at Simon Fraser University who hopes to pursue her goal of becoming a speech pathologist. Once she completes her bachelor’s degree she will need additional schooling, which she says this money will make possible. “It’s exciting having money go towards my tuition. My education is important to me,” Lundrigan said. Softball has always been a passion for Lundrigan and the lessons she has learned through the sport, she said, are ones that stay with her both on and off the field. “We practice a lot so you have to give it your all everyday and that’s something I’ll take into my jobs and everyday life,” Lundrigan said. Currently, Lundrigan is the starting shortstop for the SFU Clan, competing in NCAA Division II, and is training to compete as part of Team B.C. at the 2017 Canada Summer Games. Lundrigan says she is trying to get better every season at her school and is working towards making the national team. 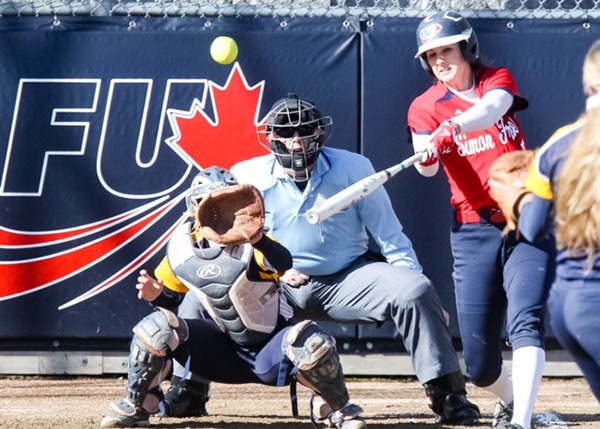 Lundrigan was previously a member of Team Canada at the 2015 WBSC Junior Women’s World Softball Championship, where the team finished fourth, and won a gold medal as a member of the Delta Heat at the 2014 U18 Women’s Canadian Championship.